GM's full-sized SUVs, the Chevrolet Avalanche, Tahoe and Suburban, the GMC Denali, Yukon and Yukon XL and the Cadillac Escalade, came with several different suspension options. It can be confusing when buying replacement shocks and suspension to try to figure out if your SUV has a premium Smooth Ride or Autoride. 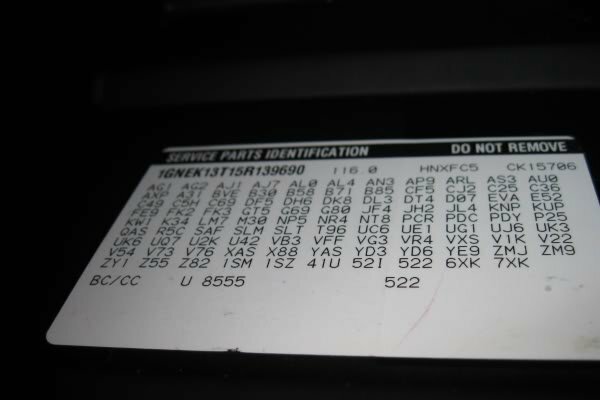 Every vehicle that GM produces comes with a sticker listing the alpha-numeric codes of all of the vehicle's options. These are known as RPO codes and can be very useful when trying to determine what type of suspension your GM SUV has. There are 3 different "styles" of suspensions that these vehicles come with. Conventional: there are numerous RPO codes for different types of conventional suspensions, the most well-known being Z71 and Z66. These suspension codes are interchangeable and standard aftermarket shocks will fit any type of conventional suspension. This suspension uses the most basic components: a coil spring or torsion bar spring with a conventional gas charged shock absorber. The Bilstein Heavy Duty and 5100 Series or the KYB Monomax and Gasajust are popular performance replacements. The KYB GR2 and Monroe Reflex and Sensatrac are good quality OEM replacement shocks. Premium Smooth Ride: indicated by the RPO code ZW7. This suspension uses a conventional suspension in the front, but the rear uses a self-contained, self-leveling Nivomat shock in the rear. ZW7 equipped trucks come with a softer spring in the rear since the Nivomat self-leveling system does some of the work of holding the truck up. Replacing a ZW7 Nivomat unit with a standard shock requires also replacing the spring, otherwise the truck will sag in the rear and have a much harsher ride and potentially dangerous handling. Autoride: indicated by the RPO code Z55. This suspension system uses electronic shocks in the front that automatically adjust to road conditions, becoming stiffer or softer as necessary. The rear will use an electronically controlled self-leveling air shock that is monitored by ride height sensors and inflated remotely from an on-board air compressor. This is a RPO sticker for a GM SUV with Z55 Autoride. This sticker is always found on the inside of the glove box door. You can see the codes are in numerical order and that this vehicle came equipped with the Z55 Autoride suspension. 1. Convert the vehicle to a conventional high-end monotube shock suspension with shocks and springs. It will shut off your computer and air system and will help you avoid costly future repairs, but let you keep the same smooth ride. A conversion kit typically costs around $700. 2. Eliminate the computer system with premium shocks, but keep the air ride leveling system for towing. This is for people who tow a boat or a trailer. This eliminates the electronic shocks but keeps your rear air system operational for towing heavy weight. This will cost around $870. This will be a major improvement in ride quality. If you need to replace the air compressor for this system choose part P-2793 Arnott Air Compressor Avalanche, Escalade, Tahoe, Yukon, Suburban. 3. Eliminate the computer system with economy low pressure twin tube shocks, but keep the air ride leveling system for towing. This is for people who do light towing and low miles or are trading in the vehicle soon. This eliminates the electronic shocks but keeps your rear air system operational for towing. This will cost around $460. 4. The 4th option is to replace it with OEM shocks . This costs around $1300 and restores your electronic and air shocks to the same as factory. 5. If you need to just replace the rears and want to keep the factory electronic and air leveling you can purchase an Arnott AS-2708 which is a remanufactured OEM shock with all new components. This has a lifetime warranty. These cost $182.9 each plus a $50 core charge that you will receive back one you return the old shocks back to Arnott. Call us at 1-800-245-7469 and we can walk you through the options. Save $15 on order. Use discount code DECODE at checkout.